The mist that originates from cars driving over wet salty roads will do harm to vegetation and trees. “Pine trees surrounding those roads will show pines that color brown” says Frank Moens of the Dutch Tree Association. But also trees that have no leaves in winter, will suffer from the salty mist.When the salty mist reaches the buds of the trees, it will lead to de-hydration caused by the salt resulting in damages to the leaves even before becoming a leave. The salty mist can also attack the bark of trees. “This attack can result in “wounds” that gave easier access to dangerous wood decay fungi, says Moens”. In spring, trees will get the next attack when they get exposed to much to salty ground water via their roots resulting in lack of leaves.. Only excessive rains will “dilute” this very negative side effect of use of road salts. And the damaging effects to vegetation will last long: “trees that create less leaves in spring because of salt exposure, will loose their leaves earlier in fall” says the spokesperson of the Dutch Tree Association. 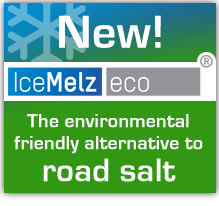 That’s why: if you can, use as much as possible IceMelz eco during the winter to avoid damage to our precious environment!